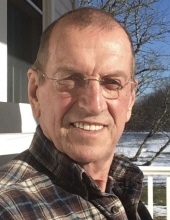 William H. Pfeiffer, 73, of Coventry, husband of Donna (Vadnais) Pfeiffer passed away peacefully Sunday February 17, 2019 surrounded by his loving family at Hartford Hospital. He was the son of Herbert and Minnie(Dennis) Pfeiffer of Coventry. Born on June 30, 1945 in Manchester, he lived most of his life in Coventry. Self Employed, he owned and operated Honey Bee Farm Excavators. While running that business he lovingly restored the only remaining farm on Rt 31 in Coventry. He really enjoyed life and traveled often with his devoted wife. He enjoyed camping fishing and hunting. Fishing was a great love and past time for Bill. He shared a great many fish tales with his buddies Ed, Paul and Bill. He loved camping and fishing with his grandchildren. He had a great love for all animals and really adored his two dogs Emma and Lizzy. Besides his wife, he leaves his sisters, Jeanette Hubbard her husband, Robert Wolak of Vernon Ct, Doris Boulanger, her husband, Leo of Vernon Ct, mother in law, Rita Vadnais of Willimantic Ct, daughter, Susan (Suzie) Larson her husband, Glenn of Barkhamsted Ct, his son, Erik Pfeiffer of Windsor Ct, eight grandchildren, Richard McAllister of Winchester Ct, Mary McAllister of Torrington Ct, Patricia McAllister of Valhalla NY, William McAllister of Colebrook Ct, Daniel McAllister of West Roxbury Ma, Kelly McAllister of Torrington Ct, Margaret McAllister of Barkhamsted Ct and Nina Tripodina of Barkhamsted Ct. As well as many nieces and nephews. He will be fondly remembered by many residents of Coventry and surrounding towns. Bill enjoyed helping his neighbors and friends in need and was always there to lend a hand. Bill is predeceased by three sisters, Eleanor Green of Glastonbury Ct, Mildred Alisch of Cranston RI, and Barbara Sposito of Bolton Ct.
To send flowers or a remembrance gift to the family of William H. Pfeiffer, please visit our Tribute Store. "Email Address" would like to share the life celebration of William H. Pfeiffer. Click on the "link" to go to share a favorite memory or leave a condolence message for the family.